A regular nesting species, migrant, and rare winter visitor. The species was abundant during the Minnesota Breeding Bird Atlas (MNBBA). The White-throated Sparrow is widely distributed from the eastern Canadian provinces and New England states to British Columbia but in a narrow band along the ecotone between coniferous and deciduous forests (Figure 1). Highest reported densities are in northeastern Minnesota, north-central Ontario, and Labrador. Short-distance migrant, winters in the southeast, northeast, and lower midwestern United States as far west as Arizona as well as along the Pacific Coast. Omnivorous, including insects, arthropods, seeds, buds, fruit, and a variety of plant parts; primarily gathered from the ground. Cup nest on the ground or slightly elevated and well concealed in vegetation. Breeding distribution and relative abundance of the White-throated Sparrow in North America based on the federal Breeding Bird Survey from 2011 to 2015 (Sauer et al. 2017). In the late 1800s and early 1900s, Roberts (1932) described the White-throated Sparrow as “a common summer resident in the evergreen forests from Isanti County northward.” Its westward distribution included eastern Kittson and central Marshall Counties, plus tamarack bogs in Isanti, Otter Tail, and Sherburne Counties. Despite difficulty in finding nests, confirmed nesting was documented in the late 1800s and early 1900s in Cass, Cook, Isanti, Itasca, Lake of the Woods, Marshall, and St. Louis Counties as well as Itasca Park and the Lake Mille Lacs area. Most of the nests Roberts confirmed for this species were substantial documentations, such as nests with eggs, young unable to fly, or young just ready to leave the nest. The exceptions were in Cook County, where he stated the “brood of young just able to fly,” and in Lake of the Woods County, where he reported only a nest. Green and Janssen in 1975 emphasized the White-throated Sparrow’s primary breeding distribution in the northeastern and north-central regions of the state. They also suggested it had marginal presence in the southern and western fringes of these areas. They added confirmed nests beyond those reported by Roberts for Anoka, Beltrami, Hubbard, and Pine Counties. Inferred nesting was also included for Carlton County. Janssen’s (1987) findings reinforced the distribution described by both Roberts and Green and Janssen. He confirmed nesting in 11 counties since 1970 in Aitkin, Beltrami, Cass, Clearwater, Cook, Crow Wing, Hubbard, Koochiching, Lake, Mille Lacs, and St. Louis. Later Hertzel and Janssen (1998) included a total of 13 counties with confirmed nesting since 1970 by adding Marshall and Roseau Counties. The Minnesota Biological Survey (MBS) (Minnesota Department of Natural Resources 2016) recorded 1,805 breeding season locations and substantiated breeding observation locations previously suggested by both Green and Janssen (1975) and Janssen (1987). Their observations reinforced that the major range of the species is in the northeastern and north-central parts of the state. However, they also included locations from northwestern, west-central, central, and east-central Minnesota, including the following counties: Becker, Chisago, Douglas, Mahnomen, Otter Tail, Polk, and Stearns. The MNBBA again reinforced the White-throated Sparrow’s extensive breeding distribution throughout the northeastern and north-central regions (Figure 2). The MNBBA recorded a total of 4,207 records with a high proportion of blocks recorded in all counties from Aitkin County northwest to Beltrami and Lake of the Woods Counties, and all counties in the northeast to Cook County. Nesting was confirmed, probable or possible in 29.6% (1,413/4,765) of the blocks covered in the state (Figure 3, Table 1). The only new county with a confirmed nesting record included several blocks in Carlton County. Another nesting record was confirmed for Anoka County, but this one was from the southwestern portion. The previous record, reported by Green and Janssen (1975), was from the Cedar Creek Forest in the northern half of the county. Hence, this is the most southerly confirmed nesting record for Minnesota. Probable nesting was also documented in Otter Tail County and Kittson County, and possible nesting in Becker, Benton, Mahnomen, Morrison, Polk, Stearns, and Wadena Counties. All of these counties are on the western fringes of the breeding range of the White-throated Sparrow in Minnesota. They include counties where the species had been observed during the breeding season, such as by the MBS and as reported by Janssen (1987), but nesting had not been confirmed. The MNBBA probability map predicted highest breeding densities of the White-throated Sparrow from southeastern Roseau County to southern St. Louis County, generally the northeastern and northern forested regions (Figure 4). Populations with lower densities were predicted in west-central Minnesota to Becker and Otter Tail Counties. In Minnesota it is logical to assume that deforestation in the southern and western parts of the state may have resulted in a retraction of the species’ range northward. However, Roberts (1932) makes no mention of the species’ distribution including the southern or western parts of the state. White-throated Sparrow breeding habitat was not historically common in the prairies, grasslands, open wetlands, and deciduous forests found in southern and western Minnesota. Hence, this species may not have been a common species in these regions, or at best it was found marginally in forested habitats after forest fire or logging activities. Breeding distribution of the White-throated Sparrow in Minnesota based on the Breeding Bird Atlas (2009 – 2013). Summary statistics of observations by breeding status category for the White-throated Sparrow in Minnesota based on all blocks (each 5 km x 5 km) surveyed during the Breeding Bird Atlas (2009-2013). Summary statistics for the White-throated Sparrow observations by breeding status category for all blocks and priority blocks (each 5 km x 5 km) surveyed during the Minnesota Breeding Bird Atlas (2009-2013). Predicted breeding distribution (pairs per 40 hectares) of the White-throated Sparrow in Minnesota based on habitat, landscape context, and climate data gathered during the Minnesota Breeding Bird Atlas (2009-2013) using the General Linear Modeling method with an adjustment for detectability. Widely described as a habitat generalist in coniferous and mixed deciduous-coniferous forests with low, dense shrubby ground cover (Falls and Kopachena 2010). In Minnesota, most often found in lowland coniferous forests and in forests regenerating as a result of disturbances such as fire, logging, insects, and wind (Back 1979; Niemi and Pfannmuller 1979; Niemi and Hanowski 1984, 1992; Probst et al. 1992; Lind and Hanowski 2004) (Figure 5). MNBBA found White-throated Sparrows primarily in bogs, in upland and lowland coniferous forests, mixed coniferous –deciduous forests, and shrub wetlands (Figure 6). The National Forest Bird Monitoring (NFB) program found the species significantly most abundant and most frequent in black spruce-tamarack forests (Niemi et al. 2016). However, White-throated Sparrows were commonly found also in aspen-spruce-fir, regenerating forests, lowland shrubs, and mixed swamp conifer forests. High densities, as noted in Figure 4, were also found in black spruce–tamarack forests and regenerating lowland conifer forests in the Agassiz Lowland Subsection (Nevers et al. 1981; Niemi and Hanowski 1984; Bednar et al. 2016). Typical breeding habitat of the White-throated Sparrow in Minnesota (© Gerald J. Niemi). Habitat profile for the White-throated Sparrow based on habitats within 200 m of point counts where the species was present during the Minnesota Breeding Bird Atlas (2009-2013). Partners in Flight (Rosenberg et al. 2016) estimated a North American breeding population of 170 million breeding adults. MNBBA also estimated a high breeding population in Minnesota of 2.82 million breeding adults (95% confidence interval ranged from 2.70 to 3.00 million), almost double the 1.7 million adults in Minnesota estimated by the Partners in Flight Science Committee (2013). Yet, the Minnesota population represents less than 2% of the global population of this species. The substantial area of suitable habitat in Canada hosts the majority of its global breeding population (Figure 1). Environment Canada (2014) estimated an adult population in Canada of greater than 50 million. 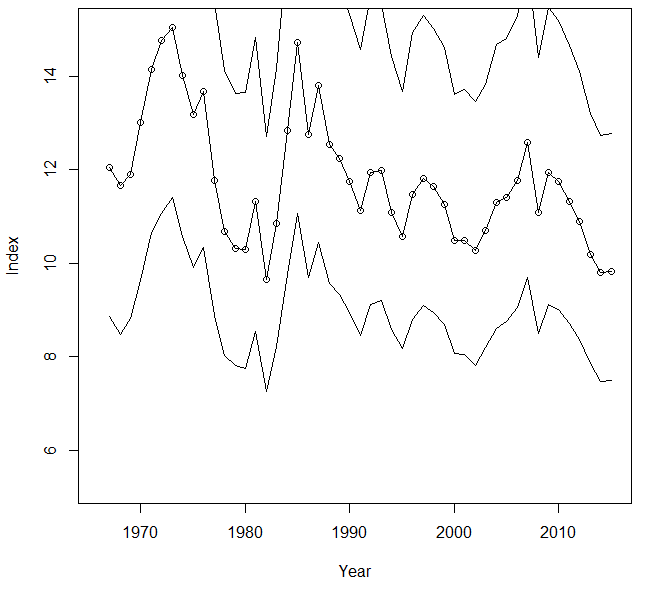 The federal Breeding Bird Survey (BBS) trend estimated for Minnesota from 1967 to 2015 was insignificant, which suggests a stable breeding population (Figure 7). However, many northeastern U.S. states and all eastern Canadian provinces during the same time period had significantly negative trends, ranging from 1.1% per year for Ontario to 7.3% per year for Massachusetts. The trends for this species were also significantly negative for all routes completed in Canada (0.87% per year), in the United States (2.04%), and survey-wide (0.93%) from 1966 to 2015. The North American geographic pattern of decline for the White-throated Sparrow is widespread but is most intense in eastern North America, northern Manitoba, northern Alberta, and the southern fringes of its range in Minnesota and Wisconsin (Figure 8). The species is increasing in British Columbia and southwestern Alberta. The BBS trend map in Minnesota is very mixed, including a pocket of increasing populations in northeastern Minnesota but also some declining populations in regions of northern Minnesota (Figure 8). NFB trends in the Chippewa and Superior National Forests indicated a stable population from 1995 to 2016 (Figure 9), but the population had seen a gradual increase from 1995 to 2004 followed by a decline back to mid-1990 levels by 2016 (Bednar et al. 2016). Partners in Flight (Rosenberg et al. 2016) suggested an overall decline in the species’ global breeding population of 29% from 1970 to 2014. From the limited analyses completed for Christmas Bird Counts, Sauer et al. (1994) reported substantial declines from 1959 to 1988 with significantly fewer numbers recorded in many southern states from Alabama and South Carolina to Florida and west to Texas. In contrast, many of the northern states had significantly increasing winter populations, from Connecticut to Kentucky and north to Michigan. This pattern strongly suggests a northward shift in the species’ wintering distribution, one that is consistent with moderating winter temperatures due to climate change. An increase in bird feeders over this time may also be a factor contributing to increased overwinter survival. However, the majority of overwintering populations are in southern coastal states, and thus analyses show a survey-wide decline in the species’ winter population. Overall mean density estimates in the Chippewa National Forest were 4.7 pairs per 40 ha to almost double that in the Superior National Forest of 9.0 pairs per 40 ha (Niemi et al. 2016). Within specific habitats, highest mean densities in the Chippewa National Forest were found in black spruce–tamarack forests, with 14.0 pairs per 40 ha. In the Superior National Forest highest mean densities were 21.2 pairs per 40 ha in regenerating coniferous forests. Similarly high densities were recorded in mixed lowland conifer forest types of 7.0 pairs per 40 ha in the Agassiz Lowlands Subsection in northern Minnesota (Bednar et al. 2016). Breeding population trend for the White-throated Sparrow in Minnesota for 1967–2015 based on the federal Breeding Bird Survey (Sauer et al. 2017). Population trend map for the White-throated Sparrow in North America from 1966 to 2015 based on the federal Breeding Bird Survey (Sauer et al. 2017). 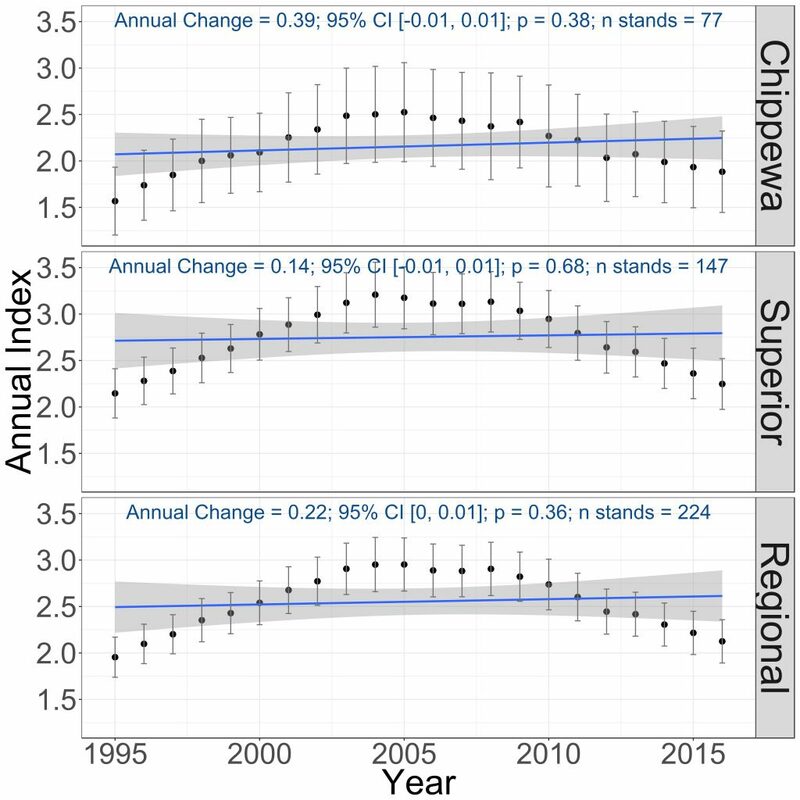 Breeding population trends of the White-throated Sparrow in the Chippewa and Superior National Forests and the combined regional trend, 1995–2016 (Bednar et al. 2016). The Continental Concern Score of 9 of 20 for the White-throated Sparrow renders it as low concern in North America (Rosenberg et al. 2016). Like many species with high estimated breeding populations and broad distributions, it faces few current problems maintaining population viability. However, its declining population in the eastern portion of its breeding range is cause for some alarm. In Canada, where most of the breeding population exists, Environment Canada (2014) stated that there “are currently no major identified threats or conservation concerns.” Nevertheless, they identified the species as a priority for conservation and as a stewardship species in several Bird Conservation Regions of Canada. Langham et al. (2015) and the National Audubon Society (2015) in its review of bird species susceptible to changes in climate identified the White-throated Sparrow as “climate threatened.” Its rationale for this designation was the potential loss of 73% of its current summer range and the uncertainty about whether similar suitable habitat will be available farther north with a changing climate. The review also suggested that the species’ winter range will expand northward. This corresponds with the potential shifts suggested by the Christmas Bird Counts, but a complicating factor includes the future availability and use of bird feeders. Falls and Kopachena (2010) stated that the White-throated Sparrow is among the most vulnerable to building collisions, having been ranked in the top 3 of 164 species based on mortality studies by Toronto’s Fatal Light Awareness Program. Machtans et al. (2013) in their review of bird mortality identified the species as susceptible to collisions with lighted buildings. The authors promoted a lights-out policy to reduce collisions with buildings. Loss et al. (2014) did not record collisions with residences or buildings as a major risk in their summary. Bracey (2011) found it was the second most common species killed at windows during her monitoring over 5 spring and fall migration periods at Minnesota Point, Duluth, Minnesota. The large decline of this abundant species over broad portions of its breeding range remains an issue to be watched in the future. Information that contributes to a better understanding of factors associated with its distribution and abundance will be especially useful. Back, Gary N. 1979. “Avian Communities and Management Guidelines of the Aspen-Birch Forest.” In Workshop Proceedings on Management of Northeastern and North Central Forests for Nongame Birds, edited by Richard M. DeGraaf and Keith E. Evans, 67–79. U.S. Department of Agriculture Forest Service General Technical Report NC-51. St. Paul, MN: USDA Forest Service, North Central Forest Experiment Station. Lind, James W., and JoAnn M. Hanowski. 2004. “Population Declines in a Boreal Forest Denizen, the White-throated Sparrow.” Loon 76: 115–122.